Driving down Falmouth Street by the university and this caught my eye. Something intriguing and not quite right at the same time. It doesn’t sit very comfortably on it’s lot. The first floor fenestration doesn’t make sense. Then there is the goofy ‘Juliet’ balcony. What if the first floor was originally a garage? Makes a bit more sense. Silas B Adams purchased the lot in 1910 and appears to have built right away. The 1924 tax record shows an age of 16 years. Current tax records says built in 1910. Looking at the 1924 record in depth, I am inclined to say it was being used for horses at that time. 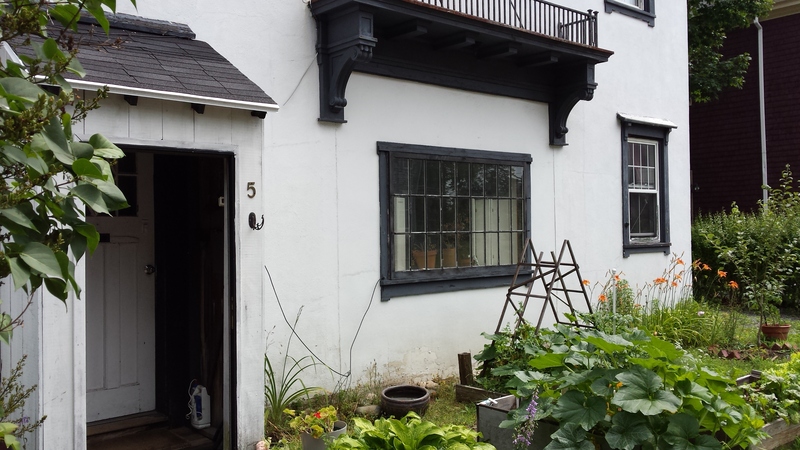 This entry was posted in Architecture, garage, Glimpses, History, Images, Oakdale, Oakdale Street, Remuddling and tagged Architecture, History, Hmm, images, Maine, Oakdale, Portland, Things that make me go hmm, University of Southern Maine on July 18, 2016 by alewifecove. I am the owner of the building (my father bought it in 1979). I found a picture of the house dated in 1955, where it still looks the same in the front. Then, the 2 doors in the center were taken out and a window put in. The downstairs was some sort of garage, as it is mostly cement slab and there are strange pipes on the ground floor (which was converted to living space sometime after 1955). I have wondered if it weren’t used for horses, based on the pipes, however the larger of the central door doesn’t really look wide enough for a horse. Silas Adams was employed by the Chicle corporation and then moved back to Maine and worked for Chicle’s Portland, Maine branch–chewing gum manufacturing. He was responsible for some patents, I believe, so it is possible the ground floor was given to his experiments. I don’t know. Hi Elizabeth. Thank You for the comments. I love hearing from the owners of my subjects. How did you find my blog? Do you have photos of the first floor and or the pipes? I’ve since learned that the building was made by one of the major share-owners of the first candy factory in Portland, formerly housed in what is now a furniture shop. It wasn’t the Chicklee company, but something close. 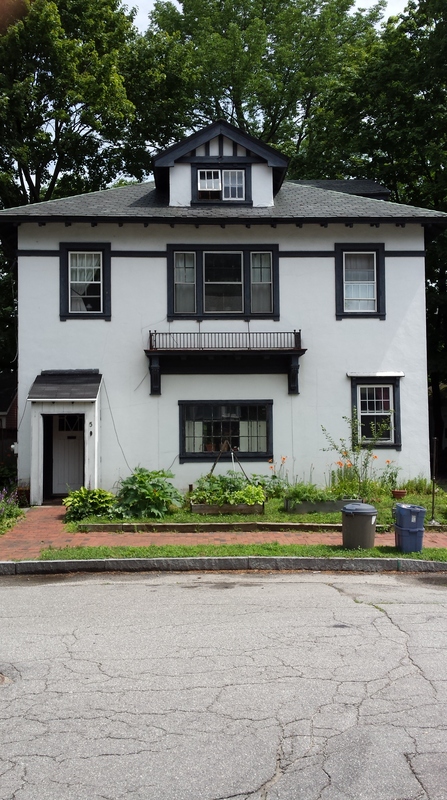 Given the man who built my home had a personal residence around the corner on Falmouth Street, I suspect he was fairly well-to-do, and what is now my house was a garage, downstairs, with 2.5 feet steel I beams almost every 7 feet between the upstairs and down. I suspect he must have owned one of the first cars in Portland, so in order to work on the car, the steel I-beams were put in order to hoist the car up, to work on its underside. My best guess. That is pretty close. Silas Adams was the treasurer of the Curtis Chewing Gum factory which was in the HUB Furntiure building. He was also the treasurer of the Casco Paper Box Co. He was living on Falmouth Street in 1910. It all points to this being his garage and maybe living area for a driver perhaps. The 1926 city directory I have says a Lewis More was running an auto repair garage and living upsatirs on Oakdale. I guess the next question is when was the first floor converted?